In Kim Stanley Robinson's new novel, "New York 2140" (Orbit, 2017), Manhattan lies partially submerged after a 50-foot (15 meters) rise in sea level. The story follows a cast of characters inhabiting one apartment building (more or less) as they commute by sky-bridge or canal, search for buried treasure, try to hack the global financial system, airlift endangered polar bears from one pole to the other, grapple with a building-buyout conspiracy — just a typical sampling of activities one might encounter in a post-apocalyptic world that kept on going. But the world is on the brink of change again, and it's humanity's choice whether it's for better or for worse. Space.com: How did this story first begin to develop? Kim Stanley Robinson: The way it came about is I did want to write a book about global finances that exist now, and how we might seize it, take it over and make it work for people. When I described that project to my editor, he said, "Well, could you maybe put it in the drowned New York that you portrayed briefly in [the] novel '2312'?" When he gave me that idea, I thought that's perfect, because global finance has a center in New York, and then all the jokes about being underwater financially could be fitted physically to the situation. The book is making the case that climate change is basically a financial disaster, or has been caused by bad economics rather than bad technology or pure number of people. It was a great suggestion, and I just ran with it. We are in an economic-slash-political system that is actually causing the problem, and so it's very hard to make it into a solution for the problem. And that's the story I wanted to tell. Space.com: How did you flesh out what the future drowned New York would look like? Robinson: First, I got a USGS [U.S. Geological Survey] topo[graphical] map of the area that included the contour intervals for elevation as well as the streets and bridges and everything. I marked the 50-foot contour interval all around the map and transferred that new coastline to a tourist map. And then I visited New York City a couple of times during the writing of the book, and I wandered the city from the Cloisters out to Coney Island, and various places where people don't go as tourists, to try to see what the new sea level situation would be like. That and a lot of reading was the bulk of my research. Space.com: How did you research the science of what would happen to those buildings in flooded conditions? Robinson: There was some really fun reading to be done there. There are these books ["The Heights: Anatomy of a Skyscraper" and "The Works: Anatomy of a City" by Kate Ascher (Penguin Press, 2011 and 2007)]. They go into the infrastructural details. And I also read a lot about Venice, because Venice is the obvious model for a drowned city — how they deal with their high tides, their "acqua alta," and how do they cope with the corrosive power of saltwater, and how do they do sewage and electrical lights. And I have to admit … I had to do a little bit of science fictional hand waving, in that they have some techs in this future world — 120 years on, materials science has given them what they call a kind of diamond spray, and also graphenated composites. Right now, these are both more ideas than realities, but they're not far off. Both of those would be incredibly useful materials to have if you were coping with a drowned New York. I figured that the land that wasn't drowned on Manhattan, New York being New York, would become more valuable than ever, and that they would build new skyscrapers up at the north end of the island, where there aren't any now. And with graphenated composites, you can begin to get away from steel and concrete, and the strength of steel and concrete in combination is a limiting factor on how high skyscrapers can go and still hold our weight. … When they talk about space elevators, they're usually talking about graphenated compounds, and talking about strengths that are like 10 times our strongest materials we have right now. Space elevators might still be impossible for orbital reasons, but tall skyscrapers would be easy, so to speak. Space.com: And those materials are crucial to the floating, tethered city blocks that one character proposes, as well. Do you think that kind of structure could actually exist? Robinson: The interesting thing is that since I've finished the book, people have sent me articles that apparently Singapore is contemplating doing this very thing, because Singapore is another city that is at sea level, and they have a problem. And they have begun to think about floating islands that are tethered as their solution. Space.com: Is the world equipped to deal with that kind of change? Robinson: I think it would be different depending on what part of the world you're talking about. The better your infrastructure and your capital supplies are, and the better government that you have, the more likely you will be able to be resilient and to work on fixes. 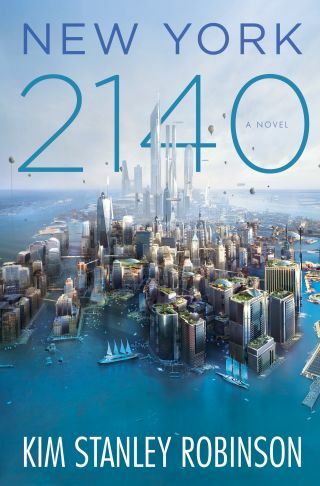 Kim Stanley Robinson wrote "New York 2140" to explore what would happen to the city after 50-foot sea level rise. My book describes a time that is about 40 years after the last rise in sea level, and everybody's extremely nervous in my book wondering if more sea rise might happen. But in any case, it's been stable for a while. But when there is rapid sea level rise, if there is a pulse of released ice from Antarctica, then it's going to be a refugee disaster and an ecological disaster. The superfund sites will proliferate. It will be a poisoned coastline for a long time. I don't want to suggest that it won't be a gigantic disaster, because it will. But what I do want to suggest is that after the disaster, people are going to be coping. They will not give up. They won't sit on the ground and weep and throw ashes on their heads and say, "Oh, woe is us. Our ancestors were idiots." They will cope. So the coping is an interesting story to try to tell. It's a science fiction story. It's a combination of technical and political and all the other elements of the human story. It will be an interesting moment in history, and the main thing that I tried to say in this novel is that in the coping process, there's going to be some positives, there's going to be some comedy. Space.com: Is there any way that expansion into the solar system, for instance, could forestall the need for climate change reform? Robinson: No. The timing is all wrong, and also the solar system is made of the wrong materials. The stuff that's out there is [made of] the most common elements on Earth, and the rare elements that might be valuable are so diffuse that mining doesn't work, and the stuff that's easy to bring back, we already have tons of. I do believe that space science is an Earth science and that the stuff that we do out in the solar system is really useful for understanding better how to manage the Earth's biosphere. And also, space is possibly good at power generation, clean power and even maybe some manufacturing — I'm thinking the moon here, because that's what I'm writing right now — where you might be able to put off-planet some of the dirtiest industries, and that would take a burden off the Earth's necessity for cleaning up pollutants that we create. Space.com: Can this kind of fictional portrayal help people avert sea level rise? Or is it more an exercise to see how humans would survive? Robinson: Maybe both at once. There was an academic debate for a while, and I think it was mostly in academia, between mitigation and adaptation. And I'm always in favor of mitigation. We should be fighting to minimize the climate change that we're creating. There's a danger in writing about climate change in positive ways. There's a danger of suggesting that it won't be so bad, it'll be OK, let's not worry about it now, let's not try too hard now. I had to walk a very fine line, because I wanted to remind everyone that in fact it will be a disaster, but that after that, it's not going to be the end of the world. I did want to strike against the idea of apocalyptic thinking. There's a strand of thinking that says, well, after the world's destroyed, things will come to an end, and so we might as well not even worry about it now. There will still be people around. In other words, there was a really delicate balance I had to keep walking in this book, and I hope that I have. This interview was edited for length. You can buy "New York 2140" on Amazon.com.